House with 5 suites, accommodation for children, sauna, pool and dependence. 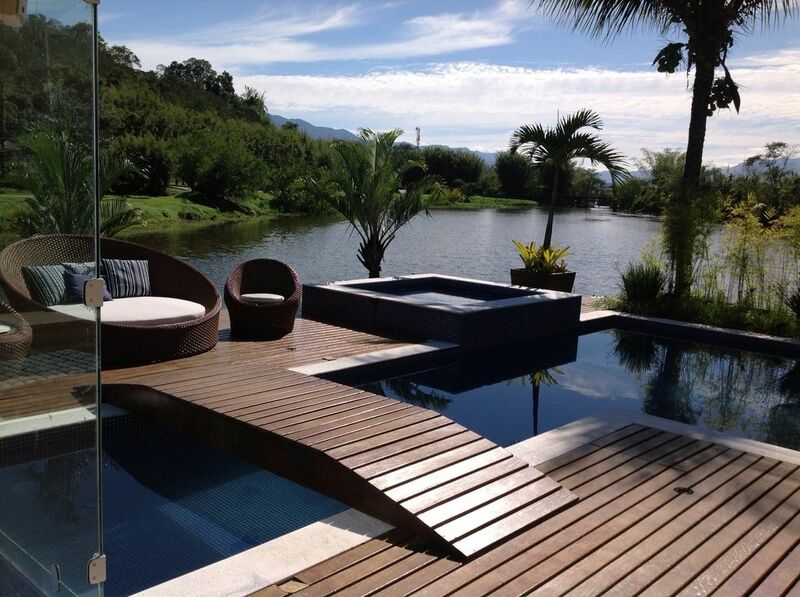 Beautiful house with 5 suites, Jacuzzi and beautiful lake view. It has modern architecture, first line finish with marbles, carved vats, ... in the outdoor area it has a stunning swimming pool, a sauna with a drop in the pool and located in the street of the Hotel Fasano. It has a wood oven and barbecue. The house is located on the street next to the marina and the beach. In the condominium we have waterfalls, bike path, club, restaurants, shops, pharmacy and lots of green. We also have the complete dependence maid, washer and dryer, air conditioning and TV in every room (except the maid). Magnificent house in condominium Porto Frade. Heated Jacuzzi overlooking the lake, swimming pool, sauna all glass with a fall in the pool, pizza oven, barbecue, decoration with fine finishes. Located on the street of the new Hotel do Frade, near the marina, on the beach road. The condominium has waterfalls, golf course, beach and restaurants.